Sehr angenehmer Aufenthalt da Nichtraucher-Unterkunft! 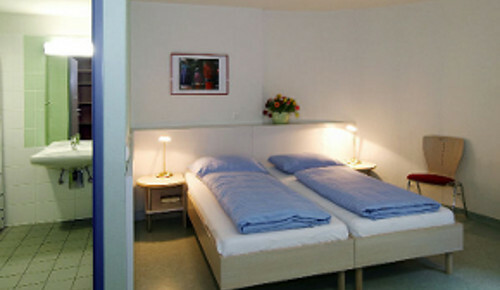 Liked the location of Bokuheim, close to the city centre and exceeded our expectation for a budget accommodation. Very helpful reception staff. I will definatly return and use again Bokuheim and recommend it to my world. 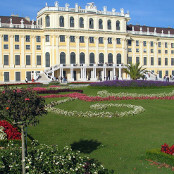 Vienna is the capital and largest city of Austria, and one of the nine federal states of Austria. Vienna has got a population of about 1.731 million and is by far the largest city in Austria, as well as its cultural, economic, and political centre. It is the 9th-largest city by population within city limits in the European Union. Until the beginning of the 20th century it was the largest German-speaking city in the world, and before the splitting of the Austro-Hungarian Empire in World War I the city had 2 million inhabitants. Vienna is host to many major international organizations, including the United Nations and OPEC. The city lies in the east of Austria and is close to the borders of the Czech Republic, Slovakia and Hungary. These regions work together in a European Centrope border region. Along with nearby Bratislava, Vienna forms a metropolitan region with 3 million inhabitants. In 2001, the city centre was designated a UNESCO World Heritage Site. Apart from being regarded as the City of Music because of its musical legacy, Vienna is also said to be "The City of Dreams" because it was home to the world's first psycho-analyst - Sigmund Freud. The city's roots lie in early Celtic and Roman settlements that transformed into a Medieval and Baroque city, the capital of the Austro-Hungarian Empire. It is well known for playing an essential role as a leading European Music Centre, from the great age of Viennese Classicism through the early part of the 20th century. The Historic centre of Vienna is rich in architectural ensembles, including Baroque castles and gardens, as well as the late-19th-century “Ringstrasse”, lined with magnificent buildings, monuments and parks. In a 2005 study of 127 world cities, the Economist Intelligence Unit ranked the city first (in close conjunction with Vancouver in Canada) for the world's most livable cities (in the 2012 survey of 140 cities Vienna was ranked number two, behind Melbourne in Australia). For four consecutive years (2009–2012), the human-resource-consulting firm Mercer ranked Vienna first in its annual "Quality of Living" survey of hundreds of cities around the world. Monocle's 2012 "Quality of Life Survey" ranked Vienna fourth on a list of the top 25 cities in the world "to make a base within" (up from sixth in 2011 and eighth in 2010). The city was ranked 1st globally for its culture of innovation in 2007 and 2008 and fifth globally (out of 256 cities) in the 2011 Innovation Cities Index, which analyzed 162 indicators in covering 3 areas: culture, infrastructure and markets. Vienna regularly hosts urban planning conferences and is often used as a case study by urban planners. 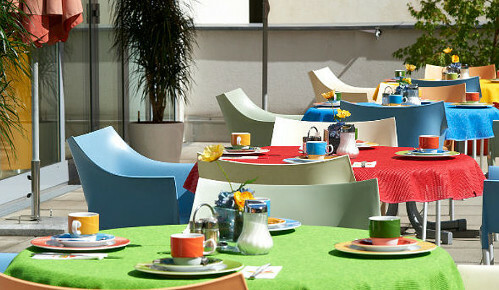 Each year since 2005, Vienna has been the world's number one destination for international congresses and conventions. 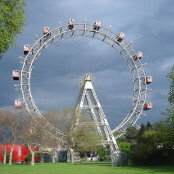 Vienna attracts about five million tourists each year. The city is home to more than 20 universities and many of the independently-owned student residences offer affordable visitor accommodation in the summer months. It should be understood that these residences are designed primarily for students - whereby some of them offer already an up to 3-star accommodation during the summer months - but not for children or adults expecting a high level of luxury. However, with this in mind, the halls do meet a level of comfort that we expect most visitors to be happy with, and we will welcome any feedback where this is not the case. There are very frequent trains from and to all neighbouring regions and countries. 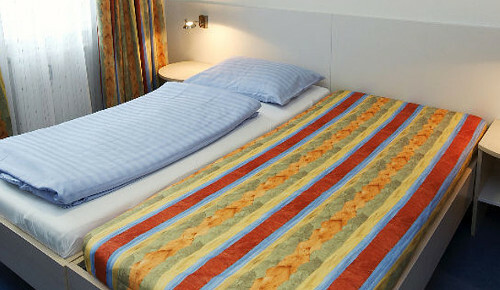 Night trains and quicker Euro-City trains arrive from virtually every city in Central Europe. High-speed ICE and RailJet trains arrive from places like Cologne, Frankfurt, Hamburg, Berlin, Munich, Zurich, Moscow, Kiev, Bratislava, Budapest, Prague, Ljubljana, Zagreb, Rijeka, Belgrade, Bucharest, Sofia, Venice, Milan, Rome and Zurich. There are frequent (at least hourly) regional trains to Czech, Slovak and Hungarian border regions. Vienna has one of Europe’s best integrated public transport networks. Flat-fare tickets are valid for trains, trams, buses, the underground (U-Bahn) and the S-Bahn regional trains. Services are frequent, and you will rarely have to wait more than five or 10 minutes. Public transport kicks off around 5am or 6am. Buses and trams finish between 11pm and midnight, and S-Bahn and U-Bahn ser¬vices between 12.30am and 1am. Twenty-one Nightline bus routes crisscross the city from 12.30am to 5am. Schwedenplatz, Schottentor and the Oper are starting points for many services; look for buses and bus stops marked with an ‘N’. All tickets are valid for Nightline services. It is highly recommended that visitors use public transportation because driving in Vienna is more of a hassle than a convenience. Parking is difficult to find and expensive, especially in the areas most likely to be frequented by tourists. There are a number of one-way streets, and it is sometimes difficult for newcomers to understand which streets are running which way. Visitors who want to avoid public transportation should opt to spend their money hiring taxis, rather than renting a car and trying to get around on their own. Taxis are metered and use standard fares which are relatively inexpensive in comparison with other European cities. Travellers should always ask drivers about rates before accepting rides, to be sure that they aren’t going to be cheated. In general, though, taxi drivers in Vienna are competent and fair. People even hire taxis to take them on tours throughout the city. Locals favour bikes, so give them a try. The low-lying Danube plain in and around what is now Vienna has had a human population since at least the late Palaeolithic: one of the city's most famous artefacts’, the 24,000-year-old Venus of Willendorf, now in Vienna's Natural History Museum, was found nearby. Vienna's own recorded history began with the Romans, who founded it in the 1st Century CE as Vindobona, one of a line of Roman defensive outposts against Germanic tribes. Vindobona's central garrison was on the site of what is now the Hoher Markt (the "High Market" due to its relative height over the Danube), and you can still see the excavations of its foundations there today. The empires also served to make Vienna a very metropolitan city at an early time, and especially so through the years of industrialization and fall of the Austro-Hungarian Empire at the turn of the 20th century. Imperial Austria and Austro-Hungary were multi-lingual, multi-ethnic empires and although the German-speakers normally played the dominant role in Vienna there has long been ethnic and lingual diversity in the city. There is proof that Jews lived in the city, dating back to 10th century. After World War II many of the city's minorities had been exiled or killed and much of the city lay in ruin. When Austria was given sovereignty after the post World War II occupation, it was eventually established that Austria was going the way of the West and not that of the Eastern Block. So the city became more isolated from its previous ties to its Slavic and Hungarian neighbours; the east of Austria was surrounded by the Iron Curtain. Vienna had gone from being the well established metropolitan city of Central Europe to the capital of a small, predominately German-speaking nation of states with strong regional identities. Since the formation of the first Austrian Republic and the first mayoral election in 1919 the Social-Democratic Party of Austria has had the majority of representatives on the common council and controlled the mayoral seat. During the early years, the socialist Red Vienna ("Rote Wien") revolutionized the city, improving the extreme conditions that the industrial revolution and rapid urbanisation had created. Most famously the city built many housing projects (housing estates or "Gemeindebauten"), and they also began to offer many social services and made improvements across the board in quality of life. 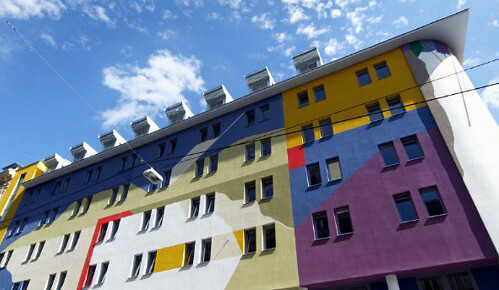 The public housing that was built at that time is now famous for its distinctive style. To this day the city continues to build public housing and about a third of the city's residents live in it, some 600,000 people. Obviously through this high percentage, the quality, and the integration of public housing across the city have kept it from becoming as stigmatised as in most cities. The Viennese are used to having the city government in their lives, and of course have a love-hate relationship with it. Vienna functions on its own as a federal state in the Austrian system (along with 8 other federal states) and the sense of local pride and home is more of being Viennese than being Austrian, many say.